I have not added a new post here for a while, I have added updates elsewhere such as Facebook and twitter. So I have continued to work on my shed and projects but I have not done any streaming for a while. This is mainly due to being busy and not setting a time to stream which I may do in future. I feel that I need a better set up with a better webcam and other set up's but maybe i'm just being picky. But I have continued to work on projects. So I am currently working on a sculpt for my little brother as a gift but also I wanted a project to start casting and this seemed like a good project for casting due to its size. 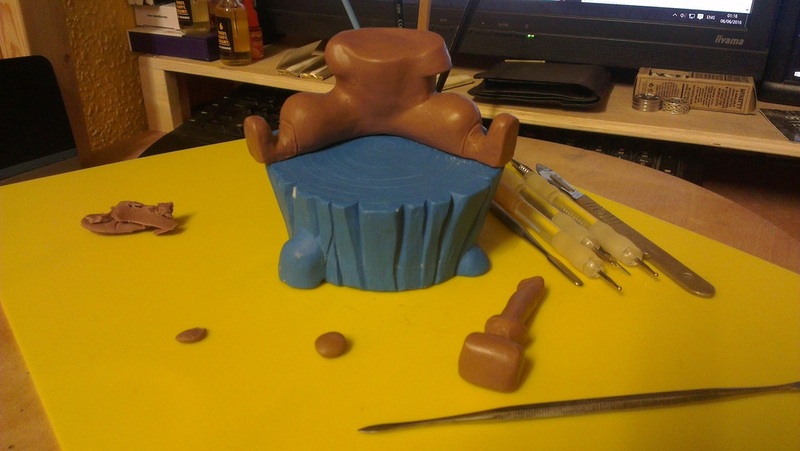 So I am creating a sculpt of Timo from league of legends. So above is a WIP (Work In Progress) picture which shows where i'm at currently. Now I am not going about this sculpt in a way that I should by sculpting the full model and then casting. As I wanted to get experience of casting I have sculpted the base and then cast it with a silicone mould and then a polyurethane cast. The blue base is that colour due to the casting materials I'm using. I am using Monster clay to sculpt which is still a new clay for me to use so I am also learning the different techniques with this clay which does not set and can be melted to a liquid. I feel its going well so far and will add more in the near future. Stay tuned. So I have been working on my shed throughout the past month (as you have seen the start of last month) and I wanted to add an update. But in this update I wanted to talk about more then just the physical side of my progress as it is never that simple. Why? I guess I want people to understand why I am starting this process and to assist this I want to share my thoughts more often. But also just to understand me as an artists or person. A while back in a lecture in college it was stated that "people are interested in the artist and not always just the artwork" and this has stayed with me. I can explain this another time as I must try to stay on topic. So not only have I been working on the shed I have also been on a major search of inspiration, or general researching about materials, techniques and so on. Yet I have not done this due to any requirement but more so as it has just kind of burst out of my frustration of not thinking this way for to long. But first the physical update for those getting bored of the mind slapsh is seperated onto the post below. 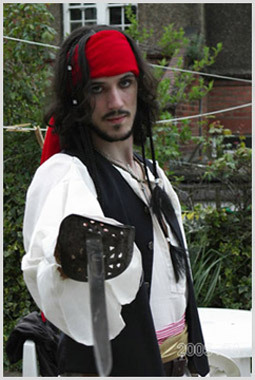 Part of my research and inspiration has been long bindge sessions on Youtube which all started when a friend posted a link on a forum for me of a Cosplay costume maker which he thought I may be interested in which I indeed was. Without all the steps included here I found Punished Props who live stream and post them onto Youtube. Punished props was a great inspirational starting point as its an area I had not look into much before this even though I have made costumes in the past. From here I continued and found the Tested Youtube Channel and they have many videos with the Fabricator/Maker called Adam Savage, I confess that I have watch many hours of these videos on the Tube. So I wanted to share the Video below. I cant help but think of talking to a friend about the Barbarian sculpture I made. The sculpt did cost more then I would have expected, but explained that as this was the first sculpture I had sculpted and the piece itself was not valuable because of the costs to create it. That even if I had somehow dropped and broke or ruin the sculpt, the cost and time were still worth doing as the amount I had learnt from that one sculpt was amazing and a place to start and improve upon. Another thing I want to mention is that this kind of content that is so easily obtainable for anyone is fantastic for young creative people. I cant help but feel that if I had seen this when I was young that Adam would have been an ideal role model for myself and that I may have found more direction that I should have taken with my love of creation, crafts and arts. This then leads me on to another thing I want to share. My Partner who knows me well sent me an image on facebook that has so much meaning for me and tugs at my emotions and I must share this and explain. A simple cartoon but it perfectly points out how people often say what they think but did not consider what meaning or impact this may have. We should all try to be more positive in life and encourage others. Rather then tell someone why they cant do it maybe point them in the right direction or at least to someone who can. We are often shaped by people around us. Lastly I want to share this video below. Just because I am also inspired by creative thinkers. Since setting up my shed I have thrown myself back into a path of inspiration that can come from anywhere. I am excited to soon be working on projects again I have many more ideas and desires to fill. 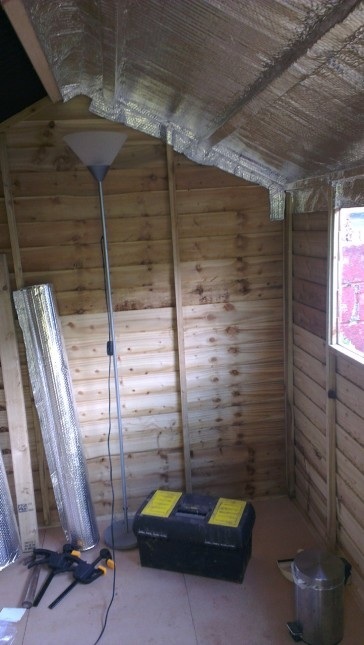 I want to use the shed all throughout the year and not have a similar problem as I had with the conservatory where its either to cold or to hot to work it and not ruin materials. 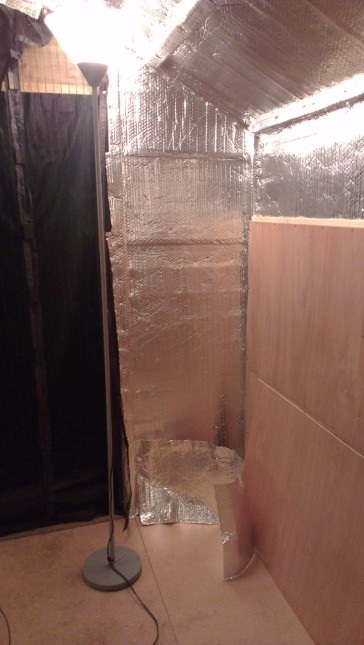 So I looked into insulation, I went for an insulation which is a bubble wrap covered in foil but is thin and leaves air gaps for the same purpose as before. The pictures show just as I started the insulation and then onto where its all insulated and the Plywood boards are going into place. At this point two things became clear which was firstly when the light was on during the night the shed became a bug magnet so I have added a magnetic mesh netting over the door and the other thing is that with the insulation up all seam have been sealed with tape so the only air flow is with the door open otherwise there is a condensation build up from just my breathing after an hour or so. So the mesh door was useful as with it open as it could be now during night time it counteracts the condensation build up. I do plan to add some vents in future, but thinking this may be part of an extraction system. I had to add extra batons to the walls to assist with the plywood interior walls which you can see in the next pictures. 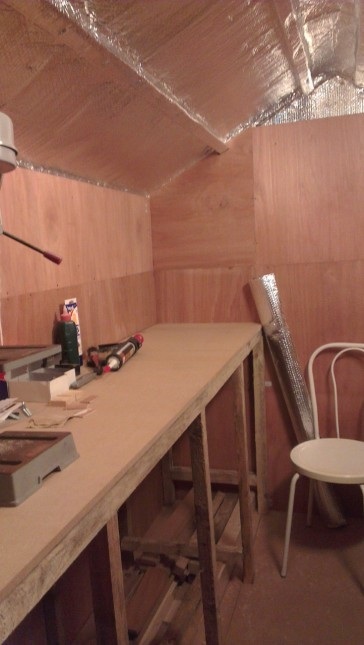 I have also moved across my patchwork desk and have build a work bench along the length of the 8 foot back wall. I am starting to move stuff in now and have up a clock. I will be filling small gaps and then the next step is onto painting the interior which will be white, mainly due to having spare white paint but also it will help with the lighting. Talking of lighting I still have to set up some proper lighting system as I'm currently using a standard floor standing light but the electrics will all need a proper system which I will get around to soon. I will also be putting my spare older PC out there to be able to start streaming when I'm working on projects so I will need to run a network cable. I also have to finish the steps which were to small to start with but I re-made them with large stones but they need to be finished. I will update once I have more photos and more done. So this was where I got up to around two or three weeks ago but as my back did not like all this physical stuff I thought it best I ease of a bit. 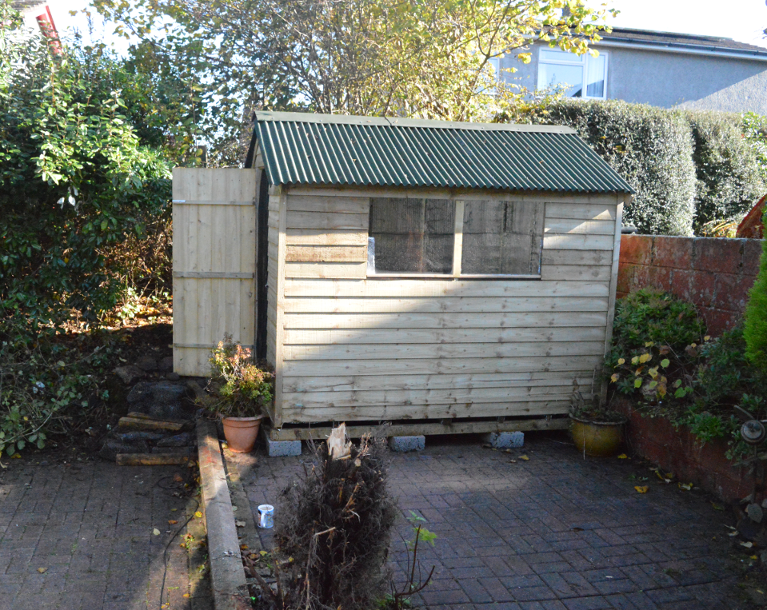 Not that I stopped I just calmed the progress but this happened anyway as I started on the many small tasks which will lead to the shed being small but usable. I do not have anymore up to date pictures so you will have wait on those. I now have a comfy chair which I will use to sit and ponder and drink tea or coffee depending on the time. I have some tarten material which I had in a box which is perfect for some curtains so I have put up a curtain wire ready for making the curtains, yes sewing is in the list of skills. I have started to put materials and tools in the shed to see what I have and plan how to store stuff. I started to think about under the work bench and at first thought of plastic storage boxes which after researching and found the expense to be more then I liked I found 10 draw runners for a little over £10 so I thought why not make draws or at least semi draw/moving shelves which is what I am currently working on. I have also started painting and filling and general wall conditions as well as improving the steps outside which I am more happier with. 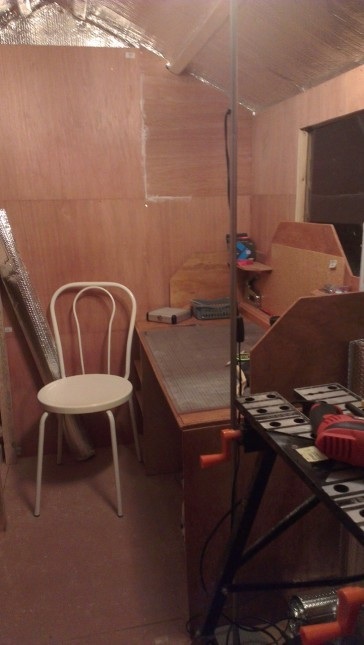 So I'm getting excited as I am getting close to finishing the set up of my new studio in a shed. Its not big but with some cleaver use it will be a great space to work in. 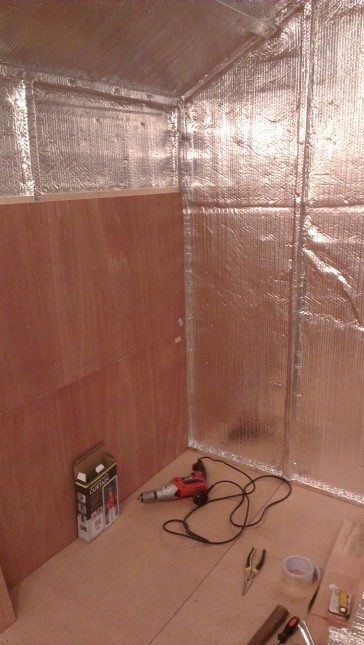 I have insulated it and currently I am putting up boards inside which I will then paint. then to make a large work top and move across my trusty patchwork desk. Thanks to those who helped me build the shed. Keep an eye on my website and these other locations: Facebook, Twitter, Twitch, and Youtube, as I will soon be starting to upload changes, updates, plans/ideas and what ever else. 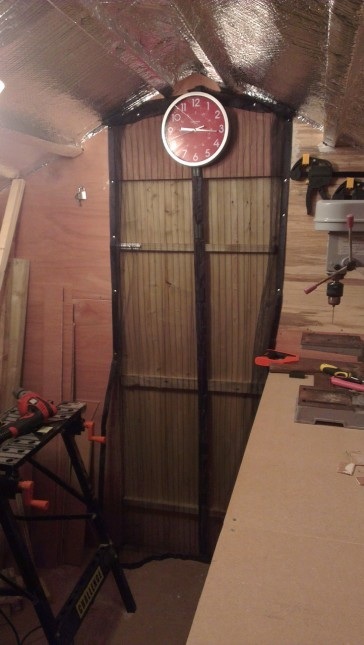 I plan to do a stream of a tour of the shed once its ready for it. Cya again soon. I am trying to get back to a position of working on projects again soon. I am currently waiting for a shed to be delivered so that I can turn it into a little space for myself to work in and store my tools and equipment. Any suggestions for naming the shed? let me know. I hope to soon be updating more often with what i'm working on. 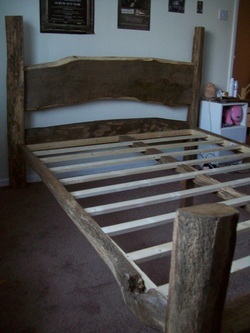 I have added pictures of the reclaimed oak bed I made at the beginning of this year. The bed is king size and I sourced the wood from a reclamation yard in the south west. The bed is built and being used but I would like to finish with carvings in many places on the bed to accent the natural lines and forms. The design is inspired by the natural forms of the chosen oak and has been designed to use a more traditional fixture method as you can see in the images. This year has not been a good year for my art work. This has been due to a busy start to the year being an agency worker for schools and then before the summer I had Labyrinthitis which is a horrid internal infection on the ear. But the good news is that I am getting back to my art work and website updates. Stick with me for some new work soon. I have found this easy to use and functional enough way to host a website for myself. Its an easy way to have a website that was better then the simple page I had before. At least now I can update this which is simple and maybe some of you will continue to come back and see how I'm getting on. My Name is Brad Easton and I am an artist. I work with any materials and continue to learn how to use many more. I do not have a specialist focus but rather use many different mediums. I currently find sculpture is what inspires me most and will continue down this road to where it may lead me.